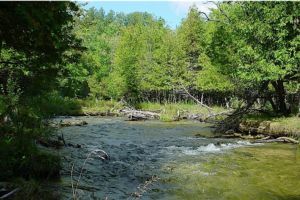 Nearly 8 miles of hiking trails wind through this 1,325-acre wetland preserve with its six miles of shoreline along the slow-moving Grass River. Take a guided walk with a naturalist or strike out on your own—either way you’ll come away dazzled by how much life there is in a swamp. Begin your Grass River Day in the Interpretive Cabin, open 10 a.m. to 4 p.m. daily from mid-June to August and on spring and fall weekends. 231-533-8314, GRASSRIVER.ORG. Take a day hike or heft your backpack for an 18-mile roundtrip overnight—either way the Jordan Valley Pathway is an adventure that traverses this 18,000-acre protected valley, with its wide-open vistas, wetlands, forests and inspiring segues along the Jordan River—the state’s first designated Wild and Scenic Fiver. Trails are marked, but they can be confusing. Before you set out, best call the state for a good map. 989-732-3541. Eight miles north of Mancelona on M-66 to Pinney Bridge Road; Eleven miles north of Mancelona on U.S. 131 to Deadman’s Hill Road. Camping is allowed at the two state forest campgrounds, the Pinney Bridge and the Graves Crossing campgrounds. 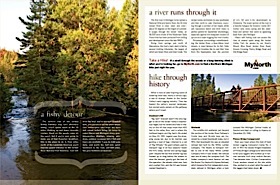 Buy the Jordan River Valley issue and get hiking, camping and fishing tips! Just click on the photo!